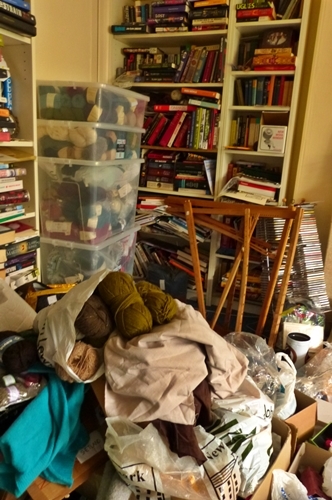 In the interest of showing you that a) I am not a domestic goddess and b) I have hoarder tendencies when it comes to yarn and books, I took this photo in the middle of tidying the living room. Pictured: two hours of sorting my stash (about one-fifth of my stash is visible), two woollie horses, a felting project, a dressmaking project, and about one-third of our books. The stash looks pretty bad in the photo, but it'll look a lot better soon. My biggest downfall is that I have no designated space for things. I would love to have my own studio space with designated storage space and some book shelves just for yarn/craft-related books. Right now I make due carving out an office space in the kitchen and a working space in the living room. It is far from ideal as I spend too much time hunting for specific balls of yarn and needles - but it's better than if I had still been living in my flat in Copenhagen which was oh.so.tiny compared to my Glasgow home. I just keep moving boxes around the house and it gets frustrating at times. I sort by stash by amounts & weights, to a certain degree. Sweater amounts are kept together, laceweights live together in two boxes, and I keep my odd balls in three containers so I can dip into them for swatching/accessory-making purposes. 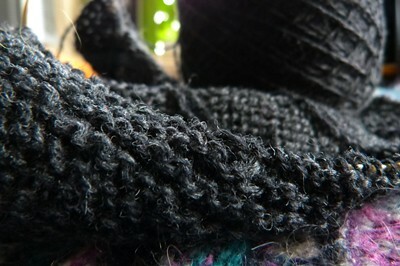 The Doggerland yarns are also kept together. Lately I have become tough on small oddments of yarn. I used to keep them, but I have begun to realise that it's better for my sanity (and storage facilities) if I let them go. Quite apart from the massive amounts of yarn in Casa Bookish, I actually struggle most keeping all my notions and needles organised. Yarn is relatively easy, but how do I organise buttons, sewing needles, threads, gauge measures, cable needles, stitch holders, safety pins etc? My knitting needles are currently all jumbled up in boxes - I know some people have beautifully organised needles with plastic pockets, folders and what not. That's never worked too well for me. Anyway, another couple of hours and the stash will be beautifully organised once more. It's always darkest before the dawn, mm? Oh, and here's a little something I'm working on in Snældan 2ply (NOM). The mysterious project is resting on top of my Bute cardigan which now only needs one sleeve and a buttonband before it's ready to go. And I might write more about the Snældan project in my next Doggerland post. I've made some decisions. But first I have tidying & organising to do.